Bank manager Vijay Singh Rajput (Bachchan) is extremely loyal to his bank, until he is sacked one day. Rajput feels so hurt that he plots revenge by robbing the bank. 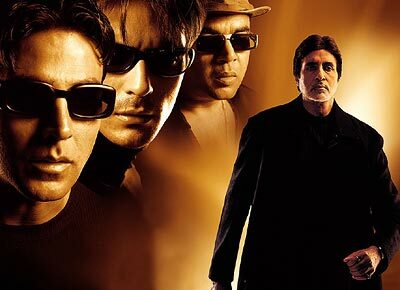 He chooses three blind man -- Vishwas Prajapati (Akshay), Arjun Verma (Rampal) and Ilyas (Rawal) and trains them for the job. The film is based on a Gujarati play, Andhalo Pato (Blindman's Bluff). Two years after the film released, an Aankhen-style bank robbery took place in a Mumbai suburb. It was a hit and made Vipul Shah (Monsoon Wedding/Satya actress Shefali Shetty's husband) a bankable director. He helms the soon-to-be released Waqt, against starring Bachchan and Akshay.